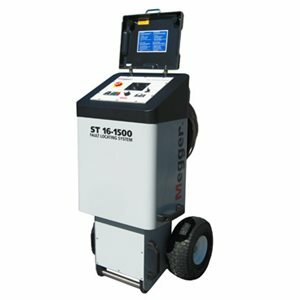 The SMART THUMP ST Series of cable fault locators provides safe, efficient and easy-to-use solution for quickly identifying, prelocating and pinpointing various types of cable faults for power cables. The ST Series was developed to meet the requirements for typical low- and medium-voltage distribution cable fault location markets. Circuit parameters include: System voltage up to 35 kV Insulation EPR or XLPE Typical conductor sizes between 34 mm2 to 250 mm2. Typical circuit lengths from 100 m up to 17,000 ft or 5,000 m.
Typical end users include: operations department of power utility The ST Series incorporates E-Tray technology, a concept that has been already proven in other products (EZThump, EZ-Restore Overdrive, and TDR T3090) and which will be carried forward into new Megger products in the future. The E-Tray adds the unique capability to access and operate every function through an innovative and intuitive user interface, without the need to make adjustments and the software suggests the next logical step.